My research interests are in applied sign language linguistics and sign language planning and policy. My recent research has included developing a parent American Sign Language (ASL) curriculum that is aligned with the Common European Framework of Reference for Languages (CEFR). Additionally, I analyze policy issues related to inclusive education, sign language recognition, and acquisition planning for ASL. Kusters, A., Green, M., Moriarty Harrelson, E., & Snoddon, K. (Eds., in press). Sign language ideologies in practice. Berlin: Mouton De Gruyter. Snoddon, K. & Weber, J. (Eds., under contract). Critical perspectives on plurilingualism in deaf education. Dordrecht, The Netherlands: Springer. Snoddon, K. (2014). Telling Deaf lives: Agents of change. Washington, DC: Gallaudet University Press. Snoddon, K. & Weber, J. (accepted, in press). Commentary: Shapes and sites of deaf people’s transinstitutionalization. Canadian Journal of Disability Studies. Snoddon, K. & Wilkinson, E. (accepted, in press). 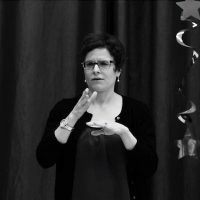 Problematizing the legal recognition of sign languages in Canada. Canadian Modern Language Review. Murray, J.J., Snoddon, K., De Meulder, M., & Underwood, K. (2018). Intersectional inclusion for deaf learners: Moving beyond General Comment No. 4 on Article 24 of the UNCRPD. International Journal of Inclusive Education. Snoddon, K. & Underwood, K. (2017). Deaf time in the twenty-first century: Considering rights frameworks and the social relational model of deaf childhood. Disability & Society, 32(9), 1400-1415. Paul, J.J. & Snoddon, K. (2017). Framing deaf children’s right to sign language in the Canadian Charter of Rights and Freedoms. Canadian Journal of Disability Studies, 6(1). Snoddon, K. (2017). Uncovering translingual practices in teaching parents classical ASL varieties. International Journal of Multilingualism, 14(3). Snoddon, K. (2016). Whose ASL counts? Linguistic prescriptivism and challenges in the context of parent sign language curriculum development. International Journal of Bilingual Education and Bilingualism. Snoddon, K. (2015). Using the Common European Framework of Reference for Languages to teach sign language to parents of deaf children. Canadian Modern Language Review, 71(3), 270-287. Snoddon, K. (2014). Ways of taking from books in ASL book sharing. Sign Language Studies, 14(3), 338-359. Snoddon, K. & Underwood, K. (2014). Toward a social relational model of Deaf childhood. Disability & Society, 29(4), 530-542. Snoddon, K. (2011). Action research with a family ASL literacy program. Writing & Pedagogy, 3(2), 265-288. Snoddon, K. & Weber, J. (in press). Introduction: Plurilingualism and (in)competence in deaf education. In K. Snoddon & J. Weber (Eds. ), Critical perspectives on plurilingualism in deaf education. Dordrecth, The Netherlands: Springer. Snoddon, K. (in press). Sign language planning and policy in Ontario teacher education. In K. Snoddon & J. Weber (Eds. ), Critical perspectives on plurilingualism in deaf education. Dordrecth, The Netherlands: Springer. Kusters, A., Green, M., Moriarty Harrelson, E., & Snoddon, K. (in press). Sign language ideologies: Practices and politics. In A. Kusters, M. Green, E. Moriarty Harrelson, & K. Snoddon (Eds. ), Sign language ideologies in practice. Berlin: Mouton de Gruyter. Snoddon, K. (in press). Teaching sign language to parents of deaf children in the name of the CEFR: Exploring tensions between plurilingual ideologies and ASL pedagogical ideologies. In A. Kusters, M. Green, E. Moriarty Harrelson, & K. Snoddon (Eds. ), Sign language ideologies in practice. Berlin: Mouton de Gruyter. Snoddon, K. (in press). L2/Ln parent education. In R. Rosen (Ed. ), The Routledge handbook of sign language pedagogy. Oxfordshire, UK: Taylor & Francis/Routledge. Snoddon, K. & Underwood, K. (2017). A social relational model of Deaf childhood in action. In T. Curran, K. Liddiard, & K. Runswick-Cole (Eds. ), The Palgrave Handbook of Disabled Children’s Childhood Studies. Basingstoke, UK: Palgrave Macmillan. Burke, T.B., Snoddon, K., & Wilkinson, E. (2016). Genetics and deafness: A view from the inside. In B. Vona & T. Haaf (Eds. ), Genetics of deafness (Monographs in Human Genetics series, 20, pp. 1-8). Basel, Germany: Karger. Snoddon, K. (2014). Baby sign as Deaf-gain. In H-D.L. Bauman & J.J. Murray (Eds. ), Deaf-gain: Raising the stakes for human diversity (pp. 146-158. Minneapolis, MN: University of Minnesota Press. Snoddon, K. (2014). Hearing parents as plurilingual learners of ASL. In D. McKee, R. Rosen, & R.McKee (Eds. ), Teaching and learning of signed languages: International perspectives and practices (pp. 175-196). Basingstoke, Hampshire: Palgrave Macmillan. Snoddon, K. (2011). Developing American Sign Language identity texts. In J. Cummins & M. Early (Eds. ), Identity texts: The collaborative creation of power in multilingual schools (pp. 149-152). Stoke-on-Trent, UK: Trentham Books. Taylor, S.K. & Snoddon, K. (2013). Plurilingualism in TESOL. Special issue of TESOL Quarterly. 47(3). Czubek, T.A. & Snoddon, K. (2016). Bilingualism, philosophy and models of. In G. Gertz & P. Boudreault (Eds. ), The Deaf Studies Encyclopedia, Volume I (pp. 79-82). Thousand Oaks, CA: Sage Publications. Snoddon, K. (2018). [Review of Innovations in Deaf Studies: The role of deaf scholars.] Canadian Journal of Disability Studies, 7(3). Snoddon, K. (2018). [Review of Things are different here.] Canadian Journal of Disability Studies, 7(2). Snoddon, K. (2017). [Review of Made to hear: Cochlear implants and raising deaf children.] Sociology of Health and Illness. Snoddon, K. (2017). [Review of It’s a small world: International deaf spaces and encounters.] Disability & Society, 32(5). Snoddon, K. (2016). [Review of Language, corpus and empowerment: Applications to deaf education, healthcare and online resources.] Discourse and Society, 27(6). Snoddon, K. (2014). [Review of The Deaf House.] Sign Language Studies, 14(4), 543-546. Snoddon, K. (2013). [Review of Growing Up with Languages: Reflections on Multilingual Childhoods.] TESOL Quarterly, 47(3), 660-662. Snoddon, K. (2018, September 5). Taking risks in Canadian sign language recognition. Paper presented for colloqium in Sign Language Recognition, 2018 British Association for Applied Linguistics Conference, York St. John University, York, UK. Snoddon, K. (2018, August 23). Sign language planning and policy in Ontario teacher education. Keynote presentation at the Multidisciplinary Approaches in Language Policy & Planning Conference, Ontario Institute for Studies in Education, University of Toronto. Snoddon, K. & Weber, J. (2018, May 3). Translanguaging and sign language vitality in education for deaf learners. Paper presented at 2018 CCERBAL Conference, University of Ottawa, Ottawa ON. Paul, J.J. & Snoddon, K. (2017, May 31). Imagining deaf futures in the era of trickle-down ASL economics. Paper presented at Canadian Disability Studies Association Conference, Ryerson University, Toronto ON. Snoddon, K. (2017, March 18). American Sign Language revitalization for parents of deaf children. Paper presented for colloquium in ASL Revitalization in Bilingual Deaf Education, American Association of Applied Linguistics Conference, Portland, OR. Snoddon, K. (2017, March 19). Teaching ASL in the name of the CEFR: Exploring tensions between plurilingualism and ASL teaching ideologies. Paper presented for colloquium in Sign Language Ideologies, American Association of Applied Linguistics Conference, Portland, OR. Snoddon, K. (2016, June 20). Renegotiating Language and Cultural Norms in Developing a Parent ASL Curriculum. Paper presented at Translanguaging and repertoires across signed and spoken languages: Insights from linguistic ethnographies in (super)diverse contexts, Max Planck Institute for the Study of Ethnic and Religious Diversity, Göttingen, Germany. Snoddon, K. (2016, June 17). Developing a Parent Sign Language Curriculum: Ethical and Policy Issues in Early Intervention for Deaf Children. Paper presented at Language and Health: Ethical and Policy Issues Conference, McGill University, Montreal QC. Snoddon, K., & Underwood, K. (2016, May 28). Can a Human Rights Framework Support the Social Relational Model of Deaf Childhood? Paper presented at the Canadian Disability Studies Association Conference, University of Calgary, Calgary AB. Snoddon, K. (2016, May 4). Problematizing a sign language rights framework. Paper presented at Inviting Movements: Emerging Critical Disability & Deaf Perspectives and Practices, Concordia University, Montreal, QC. Paul, J.J. & Snoddon, K. (2015, September 5). Biolingual Process: Viewing Sign Language Rights through the Lens of the Canadian Charter of Rights and Freedoms. Paper presented at Multidisciplinary Approaches to Language Policy and Planning Conference, University of Calgary, AB. De Geus, M., Oyserman, J., & Snoddon, K. (2015, July 30). Using the Common European Framework of Reference for Languages to teach sign language to parents of Deaf children. Presentation at the XVII World Congress of the World Federation of the Deaf, Istanbul, Turkey. Snoddon, K. (2013, August 16). Hearing parents as plurilingual learners of ASL. Paper presented at Interdisciplinary Approaches to Multilingualism 2013 Conference, University of Calgary, AB. Snoddon, K. (2012, June 15). Equity in education: Signed language and the courts. Presentation at Taking Stock of Inclusion in the Education Sector: Where Have We Come From, Where are We Going, Atlantic Human Rights Centre, St. Thomas University, Fredericton, NB. Snoddon, K. (2010, September 17). Equity in education: Signed language and the courts. Presentation at the San Francisco State University Rights Conference, San Francisco, CA. Snoddon, K., (2010, July 19). Facilitating phonological awareness through participation in a family ASL literacy program. Symposium presentation at the International Congress on the Education of the Deaf, Vancouver, BC. International Research Seed Grant, Carleton University. Project: Internationally Advancing a Curriculum Framework for Teaching American Sign Language to Parents of Deaf Children, Principal Investigator. Amount: $6,000. 2017-present. Development Grant, Carleton University. Project: Finalizing a Curriculum Framework for Teaching American Sign Language to Parents of Deaf Children, Principal Investigator. Amount: $6,100. 2016-17. SSHRC Insight Development Grant. Project: Developing a Parent ASL Curriculum, Principal Investigator. Amount: $74,580. 2014-16. Killam Research Fund, University of Alberta. Project: Evaluating a curriculum framework for teaching sign langauge to parents of deaf children, Principal Investigator. Amount: $5,886. 2013-14. SSHRC Postdoctoral Fellowship. Project: Children’s Book Sharing with ASL, Principal Investigator. Amount: $81,000. 2010-12.